Mageplaza SMTP will assist you to resolve email sending issues. By available popular email server providers, our extension absolutely would like to help you in sending email with a huge amount of quantity, faster along with high secure authentication. Hence, Mageplaza SMTP will also provide you a log diary which archive all the detail sent emails, makes it easier to keep track and checking problems. Be ready to say goodbye to Spam box issue. 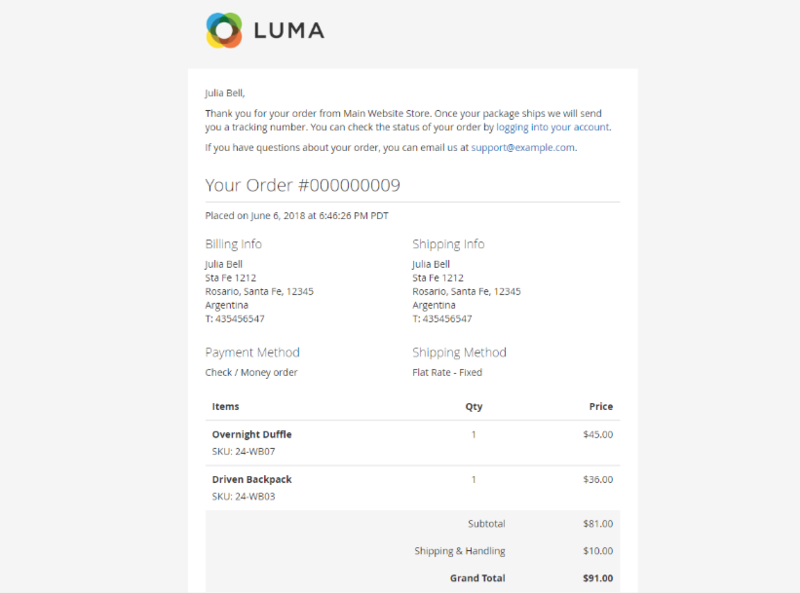 This can be accessed by the following Stores > SMTP > Emails Log. From here you can look back all the sent email from the server to customers. At here, you can view all information as ID, Subject, From, To, Bcc, Status, Created At as well as allow admins to take some actions for emails that are sent from the server to customers. At the same time, you also delete all emails by clicking on the Clear button. View: To review the content of the email that is saved in the Emails Log. Admin can review by clicking Select > View in the Action column. In the Action column, choose Select > Resend. This means that the selected email will be resent once and that Email Resend is also logged, which enables admins to know if the Email Resend is sent successfully or failed. The Resend feature can work well even if you disable the module. The Resend Email will apply the Provider of SMTP, however, it won’t be logged in the Emails Log. To resend lots of emails at once, you only need to tick, then choose Action at the upper left of the Grid, and select Resend. In the Action column, click Select > Delete: This means that the selected email will be removed from the grid. To Delete many emails at once, you only need to tick, then choose Action at the upper left of the Grid, and choose Delete. Be sure you’re at Admin Panel, for general configuration Stores > Settings > Configuration > Mageplaza > SMTP. Choose General Configuration sections. In the Enable Mageplaza SMTP field, select “Yes” to enable Mageplaza SMTP extension. Yes: Sent emails will be saved in the Emails Log, you can preview it and have it clean up to follow the fixed schedule. No: Sent emails won’t be archived. Clean Email Log Every: This field limits the storage time for the email you sent. After that limited number of days, Email will be auto-deleted. If you do not want to delete the emails, leave the field blank. 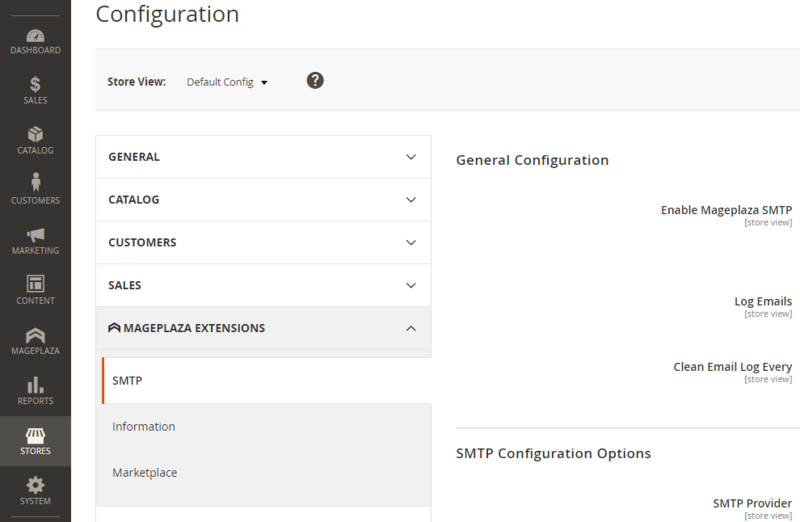 Still from the same structure with SMTP General Configuration, go to Stores > Settings > Configuration > Mageplaza > SMTP, then choose SMTP Configuration Options sections. In the Host field: This is a field that allows you to fill in the Support Host name and ID address. If you click on Load Settings button, a popup about SMTP Providers will be displayed. Admins can choose SMTP Provider that they want and the system will auto-fill some fields as Host, Port, and Protocol. SSL stands for Secure Socket Layer. This protocol ensures that all data exchanged between the web server and the browser is secure and stay safe. TLS means Transport Layer Security. This protocol can secure data or messages and validate the integrity of messages through message authentication codes. Login: Authentication by login to the account through Username and Password that will be filled in the next field. Most of providers will require this method. In the Username field: This field allows you to fill in the Account name according to SMTP Provider format that you have selected. In the Return-path email field: Leave it empty if you want to ignore this. In the Send Test Email: This is a field for you to test the operation of the extension. Send From: Admins can choose one of the five Email Sender of Magento. Send To: Allow entering the email address that admins want to test the email. To test the email, you need to fill the email address in the Send To field, then click Test Now button. From the Admin Panel, go to Stores > Settings > Configuration > Mageplaza > SMTP, choose Developer sections.